The 2017 Child theme for the WordPress Twenty Seventeen theme comes with a built in fullscreen homepage slideshow. After you upload and activate the 2017 Child theme add your slide images first. Title your images so you know what they are. Titles will not show. Images can be added in one of 2 ways. If you know the URL of the image add it to the area below the title. The other option, and it is the easiest, is to simply to select a feature image via the feature image dialogue box. For the best look make sure the image is optimized and is 2000 wide x 1200 high. Publish the image so it will be seen on the homepage. NOTE: Upload your images in reverse order. Last image added will be the first image shown. It is recommended to add a header image even if you are using the slider, as the this image will appear in the header on individual pages. It too should be 2000 wide. By inserting # in the URL box you are creating a link that will not go to a URL but rather show the drop down menu. The drop down menu items should then be clickable. All the fine art themes support at least 3 WordPress menus. Theme Locations: This area tells you how many areas are available to have a menu. Even if your theme doesn’t support menus, you can create a menu to use in your sidebar by using the “custom menu” widget. Links: If you want to create a link to an external site, Facebook or Twitter, you can add a custom link with an icon to the footer menu. Go to the site you want to link to and copy and paste the URL from the browser address bar into the URL box. Then provide a label (the label can be whatever you want) and click “add to menu”. All the themes have the same widget areas. The Main Sidebar contains your site menu with a widget area below. If you put widgets in to this area they will appear on all pages and posts. If there are no widgets only the menu will show. The blog widget area shows below the main sidebar on the blog only. Go to the example blog to see a number of blog related widgets that I have dragged and dropped into the widget area. The footer widget area is one full width area. Anything you insert here will appear on every page and post of your site. This is a great place for Social Media links or NextGen compact album shortcode. Below the full width footer widget are 3 to 4 horizontally stacked footer widget areas. The images below maps out the locations of all widget areas. NOTE: All widget areas have flexible height. 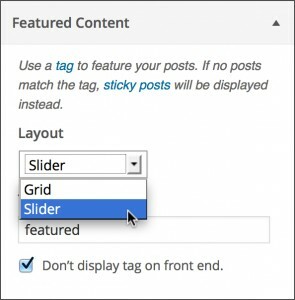 NOTE: the slider / grid only works with posts, not pages. You can either have a grid layout or a slider on the homepage. To choose your layout, open up the Theme Customizer under the Appearance tab. Under Featured Content select your preferred layout from the drop down. You can always change to the other later if you want. 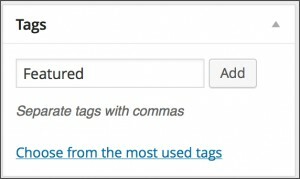 The next section will show you how to customize the Featured tag. 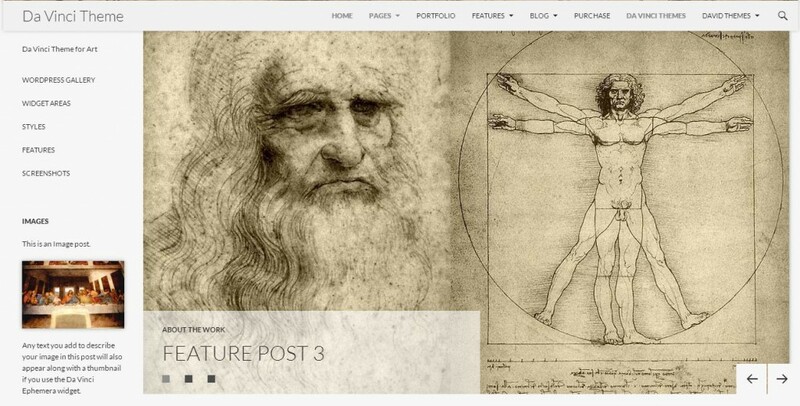 By default, Da Vinci displays any post in the slider or grid with the tag “Featured” attached to it. If no posts have this tag, a sticky post is displayed instead should you have a post set as sticky. Otherwise nothing will appear. WordPress for Art artist themes support WooCommerce. WooCommerce requires WordPress themes to have extra functions added to the theme templates. This includes adding some code to the functions file of the theme and an extra WooCommerce page template. These items have been incorporated into all David themes. Perhaps you may be thinking that you don’t want to use WooCommerce. That’s okay you can still use the David themes without the WooCommerce plugin. 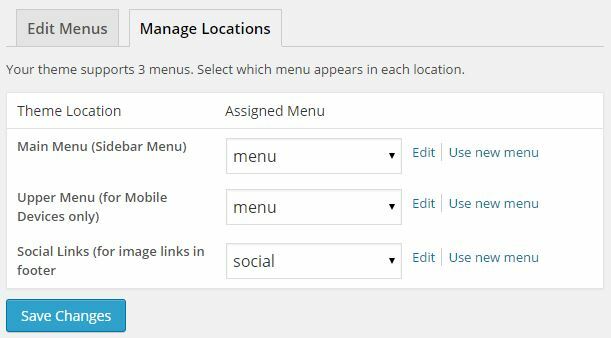 In fact you can use any WordPress shopping cart plugin you want and the extra files to support WooCommerce will not interfere with that. These extra functions and templates will only come into play when the WooCommerce plugin is activated. I added Woo Commerce to my fine art site. My experience was that I had to look up and add an number of functions to my theme’s function.php file in order to remove things like the “reviews” panel and add things like the number of products to display before the pagination kicks in. Update: Release of David 2.3.1 November 13 now includes more styles for Woo Commerce. 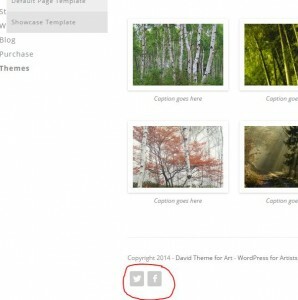 New to David Themes at version 2.0 is the ability to change the Header and the Entry Title Fonts for pages and posts. As well you can now change the color of your links. Once your theme is installed you can do a live preview to customize before publishing live. Click the Customize link in the Appearance menu or on the theme screenshot. The David theme adds two new customization features; Typography and a color selector under colors. Select the font from the drop down menu. If none is selected the default font will be applied. David Custom Fonts use the Google Font library so if you want see what the font looks like visit https://google.com/fonts and test, test, test. The header font will be applied to the site title only, the site description will remain with the default font. The entry title are the page and post titles. To reset to the default font select “default” at the top of the drop down list. Change some font colors using the color selector. The header text is your site title. Background color is typical applied around the pages of your site. But it depends on the theme. Page title applies color to all the pages and blog post titles. 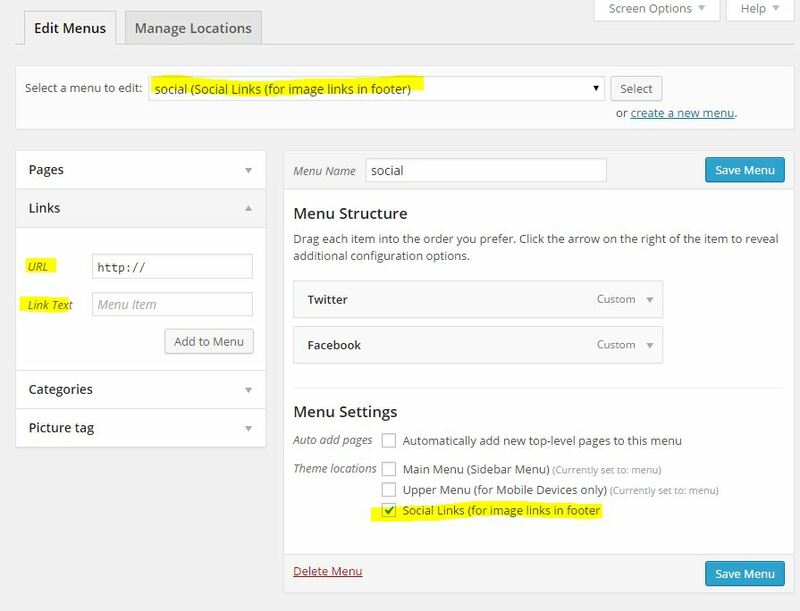 Link color will be applied to content area links only, widget area links and the main navigation menu remain at the default color. To reset back to the default colors simple click the “clear” or “default” button. Adding a header image to accompany the site title and description or replace it. Add or change the background image. How a WordPress Child Theme works. The David Theme is a what they call in theme development circles, a parent theme that acts as a framework to build other themes upon. You can use a parent theme on it’s own or with any one of it’s child themes. Basically how it works is that you install the Parent Theme and add a different looks by installing and activating a child theme. The parent theme will work on it’s own, but a child theme requires the parent theme to function. Rock-solid code for your site that is continually being updated and refined. Developers can churn out child themes more quickly, so the end user gets more choices. You can easily skin your site with new looks. Building a community around one framework offers more ideas and neat things for the end user to work with. Need help setting up WordPress? Over at Artbiz.ca we provide services for setting up a WordPress website and blog. Please read all we have to offer at WordPress for Artists Services. Once your purchase has been made you will be redirected back to this site to the download page. You will also receive the download information in an email. Download and un-zip the main .zip archive. This contains the Parent Theme .zip file and the Child Theme zip file. Once the main archive has been un-zipped you will have two zip archives; one for David and the other for the child theme you purchased. DO NOT un-zip these 2 archives, they need to remain zipped so you can upload and install it automatically. Follow these instructions for a parent theme alone. You will be downloading a .zip file. There is no need to un-zip the download file as it needs to be in .zip format to install automatically. Go to the Appearance menu and select Themes. From here, select Add New and then click on Upload Theme. Next, browse to the location of the parent .zip archive first, select it and press the Install Now button. Don’t activate the parent theme if you want to use the child theme. The parent theme just needs to be in the Themes folder for the child theme to work. Next, perform the above again but this time browse to the location of the child theme .zip archive select it and press the Install Now button. On the next screen chose to Activate. Your theme is now installed and you are all set. 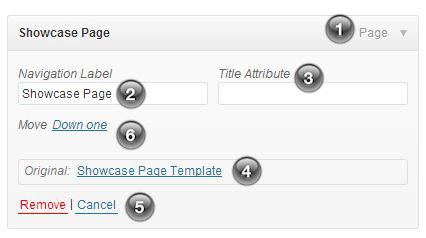 If you do not see an Appearance tab it could be that you do not have administrative rights to your WordPress site. Contact the person who set up your site. Refresh your website, it should load with the new WordPress theme. Any problems? I’m only an email away. Mac users: If your Mac is set to unzip files on download you are going to need to either re-zip it OR you can stop your Mac from unzipping zip files upon download. Please try a search using “how to stop mac from unzipping files automatically” and you’ll see a number of results. Pick one that works for you. Once you have resolved the unzipping problem with Mac you can log back into your WordPress for Art account and download the theme again. 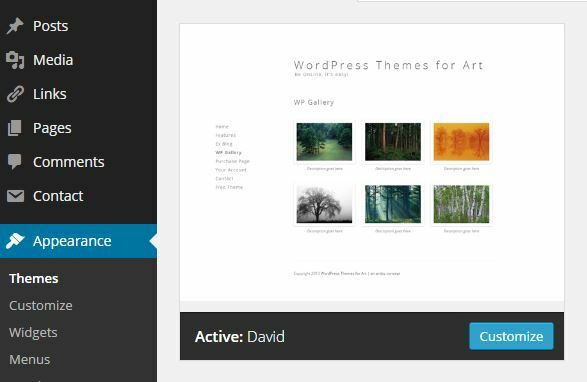 WordPress for Art only provides theme related support via our blog. We may request you to e-mail us your login details when needed, in which case we will communicate via e-mail to protect your confidential & secure details. Our general support hours are Monday to Friday, 08:30 to 17:00 (MST). During this time, we can generally provide feedback on any support queries within 12 – 24 hours, whilst we will also commit to answer any queries outside of these hours within 36 hours. We understand that there is a fine line between what is considered support & modifications. So while we will try to help you with any type of query (support or modification), we can’t provide extensive help in terms of modifications. Technical support will thus take priority over modification support. We do however provide theme modification services at artbiz.ca to help you with modifications to our themes. If you are requesting modification help, which only requires us to publish a couple lines of code, we will be glad to assist you. If however your query requires more than that amount of code to be published, we can only provide guidance and you would then need to hire an under a separate contract if you don’t have the skills to implement it yourself. It is our commitment to fix all theme bugs as quickly as possible after they are brought to our attention. During our general support hours, we can fix bugs within 24 – 48 hours. We will also try provide a solution via the knowledge base for smaller bug fixes, after which we will update the core theme package.